Building on the significant improvements and refinements already introduced in the current Game Boy Advance, the new Game Boy Advance SP features a revolutionary Front Light Screen making game play easy in any lighting condition. The system is powered by a rechargeable Lithium-Ion battery good for about 10 hours of game play and takes only three hours to recharge. Amazingly, the battery life increases to approximately 18 hours of continuous play when the Front Light Screen is turned off. 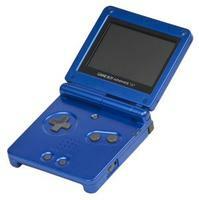 All current and future Game Boy Advance games are compatible with the new system. And, similarly, Game Boy Advance SP is backward compatible, allowing use with virtually all games and accessories previously released in the Game Boy line. * Approximate Size (Closed): Height 3.33 inches, width 3.23 inches, depth 0.96 inches. * CPU: 32-bit RISC CPU with embedded memory. * Screen: 2.9-inch reflective TFT color LCD. * Light Source: Front lights have been integrated with the existing reflective LCD. * Display Size: 1.61 inches by 2.41 inches (identical to the Game Boy Advance). * Resolution: 240x160 pixels (identical to the Game Boy Advance). * Color: Simultaneously displays more than 32,000 colors (identical to the Game Boy Advance). * Weight: Approximately 5 ounces. * Power Supply: Rechargeable lithium-ion battery. * Battery Life: 10 hours continuous play with three hour recharging period; 18 hours continuous play with light function disabled.